“Hahaha,” I thought. “He hates all the things!” Alas, he wouldn’t get the joke. So, Internet, you stand warned. For all his aversions, he loves kale, eggs in any form, stinging nettles, sweet potatoes, pungent cheeses, and blueberries. He very much likes blueberries, regarding them as the superlative berry. I, however, disagree. I don’t dislike blueberries per se, but I’ve always found them to be a bit of a bore. I’m a raspberry sort of girl, yet I turn down the corner of every blueberry recipe I read. This collection of blueberry tarts, pies, galettes, ice creams, muffins, scones, preserves, and cakes dwarfs my collection of raspberry recipes because, you see, they are a collection of love songs, mine being a kitchen sort of love: a milk spill tea leaf affection, dusky blue and sweet. Food dislikes and likes have been a source of discord, real discord, in previous relationships. I had a hard time abiding picky or what I regarded as pedestrian eaters. One man preferred fast food hamburgers and chicken fingers to all other foods, and another was always wanting quite literally meat and potatoes, yet another had a penchant for Lean Cuisine and ordering chicken teriyaki when we went out for sushi. All of this drove me to very genuine frustration. Now, of course, I know that it wasn’t their food preferences that bothered me. We were ill suited, and my love was the selfish sort that resents giving, conceding, and compromise of any sort. Even the sort of compromise that is going for Thai when I want Italian. 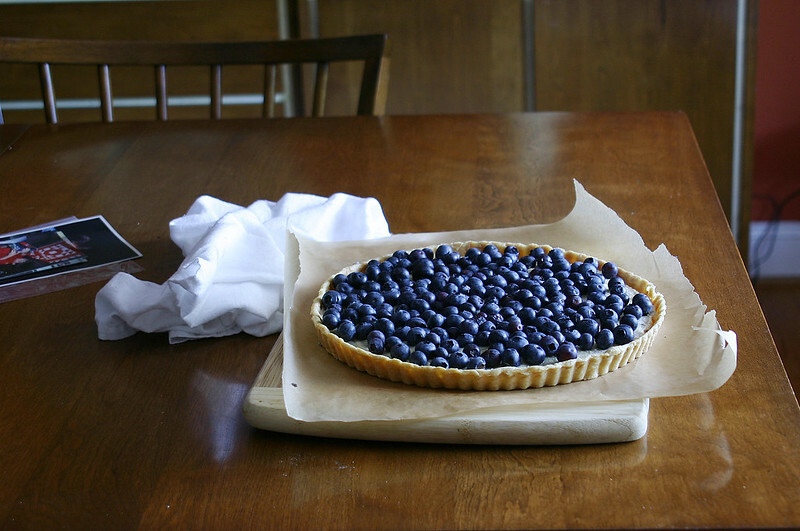 In telling contrast, I haven’t cooked a mushroom since we began seeing one another, I rarely fry bacon, and I’ve made a blueberry tart today. And I haven’t resented any of it, not at all. Bacon and strawberries are obvious sacrifices, but it should be noted that I absolutely adore mushrooms. Sautéed in butter and wine, they were a childhood favorite, an early sign of culinary tendencies. This is how I know my sentiments are real: eschewing mushrooms, bacon, and strawberries and amassing a collection of blueberry recipes without vexation. Homemade ricotta leftover from the weekend was, I knew, starred to become a tart filling, as I love nothing more than whole milk ricotta with ribbons of sourwood honey swirled in it. I eat it like ice cream with a spoon. 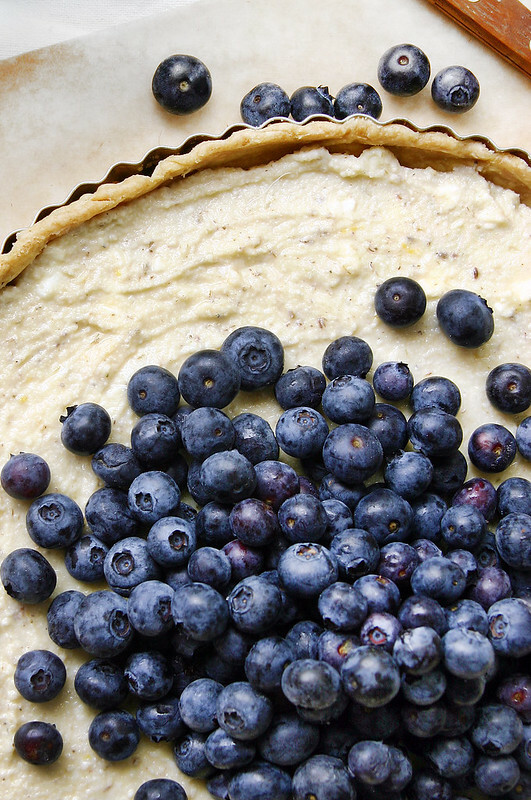 After considering various flavor combinations I decided to make a ricotta tart with honey, lemon, and lavender, all of it topped with fresh blueberries. I tried to write a song once, I guess it was a love song. It began with the lyric “lavender and honey, loss and misery…” I never got any further than that. I’m not, it turns out, a songstress. Most of my relationships prior didn’t get much further than that either. I have been, until now, unlucky in love. 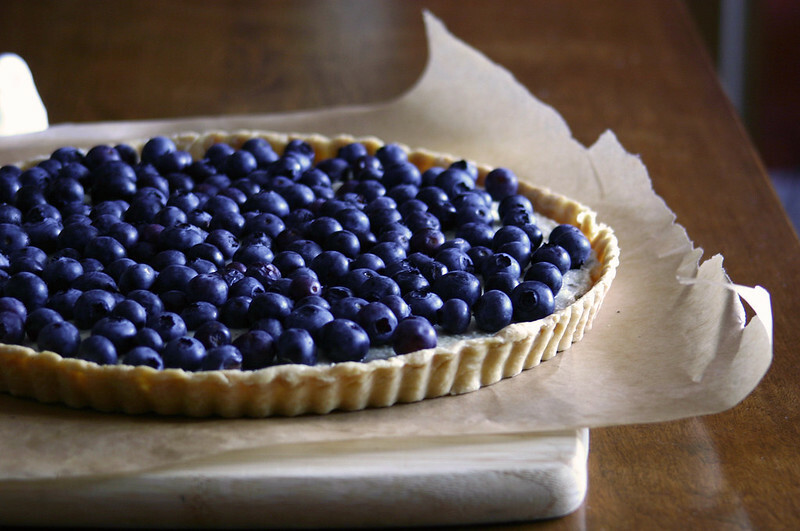 I suppose that makes me most especially grateful, leading me, starry-eyed, to effusively bake with blueberries. 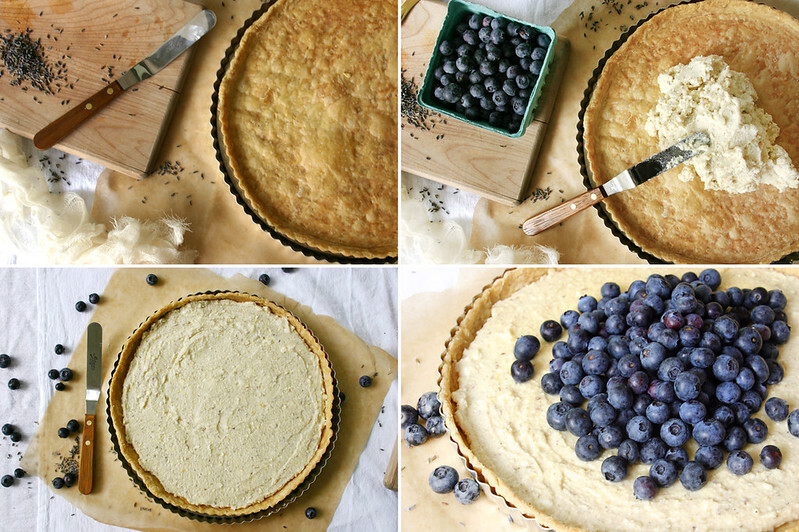 I leave you with my version of a love song: bursts of violet fruit & bright citrus with floral whorls of honeyed lavender in curds of creamy homemade ricotta punctuated by buttery flakes of tender pastry crust. After he ate it, he praised me: “You did a good *%#!ing job, woman. Well done, you.” Oh, love. The recipe. I used Thomas Keller’s Buttery Pastry Shell as my base. I’m obsessed with it. I had, shall we say…difficulties with pie crusts when I first attempted them. This was the first crust I was successful with and it’s so good for both savory and sweet fillings that I use it for everything. You make it in a stand mixer. I know, right? Stupid easy. Buttery. Flaky. I mean, it’s Thomas Keller. I used this recipe to make the ricotta cheese. Fully bake your crust: bake for 30-40 minutes with pie weights in it (I class it up with aluminum foil filled with dries beans/rice that I keep in a garbage bag in my pantry…). Remove weights and continue to bake until golden brown, about another ten minutes. It may take longer. Remove and let shell cool fully on a rack. While the shell cools mix all of the ingredients except the blueberries in a mixing bowl to combine fully. Taste and adjust to your liking. 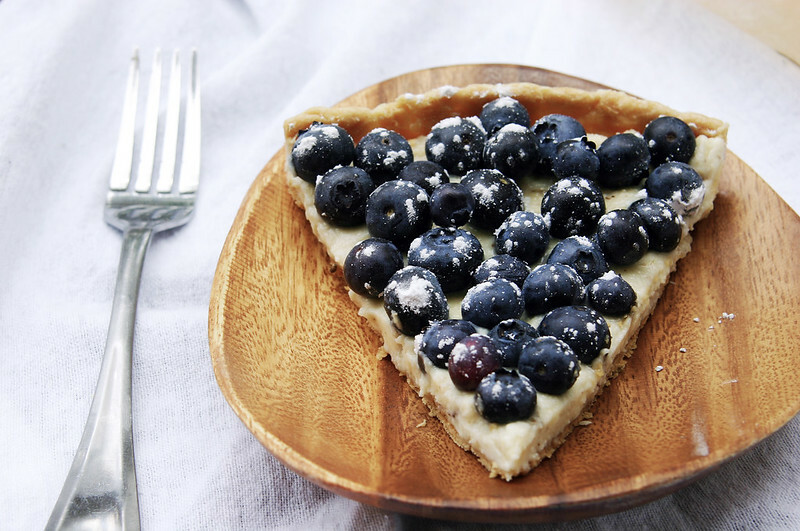 Fill shell with the cheese mixture, top with fresh blueberries, and dust with powdered sugar. Serve at room temperature or chilled. I started incorporating blueberries into my diet in utter seriousness after someone forwarded me a stack of studies aligning blueberries and memory. Trying to up my game with this whole learning-another-language thing, I started a ritual with fromage blanc and blueberry preserves every morning. I`ve not the slightest idea if they have assisted me intellectually in any shape or form, but the thought of starting the day without them… sadness. Oh my god. He would love that. I must give him that for breakfast. What do you have have with it? Bread of any sort? Sourdough is my favorite, but sometimes I mix it up with a croissant. Sourdough + fromage blanc = there are no words. Beautiful. I love the inclusion of lavender, with which I am slightly enamored. Where in the world did the blueberries come from? Mine have not fully ripened yet….each day Philip impatiently prods them and worries that they are never going to be ready for picking. I’ve got a thing for florals. HIbiscus, lavender, rose, honeysuckle, jasmine… They make me feel like some sort of happy cat noshing on flowers & butterflies. You had me at ricotta and blueberry, but with the goat cheese and lavender I’m totally swooning. I think blueberry/goat cheese/honey/lavender/lemon would make a radtastic ice cream too! Those flavors really playing nice together. I, too, am fond of TK’s all butter pastry dough. I’ve committed it to memory and use it almost every week. 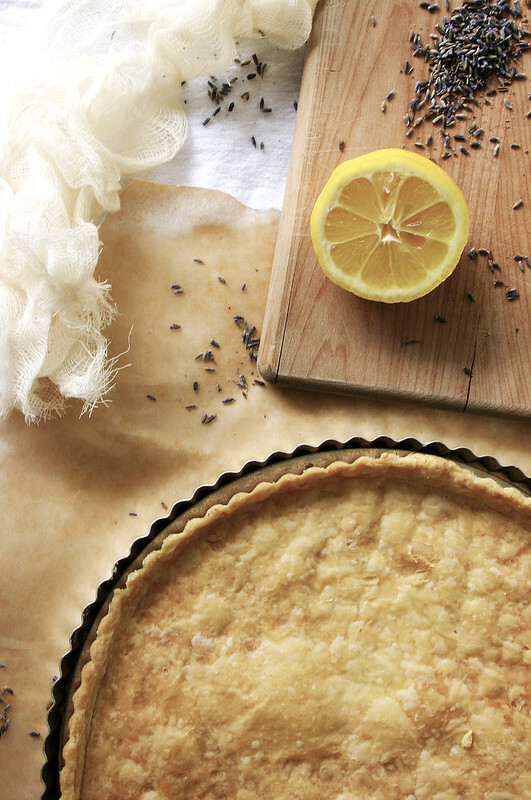 It’s perfect for any tart, pie, galette, turnover, or quiche. By the way, I’m just up the road from you–southeast of Knoxville. I read your bio and laughed out loud–another reluctant but bonafide southerner. I hear you. so much flavors that I can’t stop thinking about it! Also, I love how your blueberries have that hint of purple blue! So beautiful! Blueberries are a regular part of my diet. It is healthy and my doctor specifically wrote it in his Rx pad. 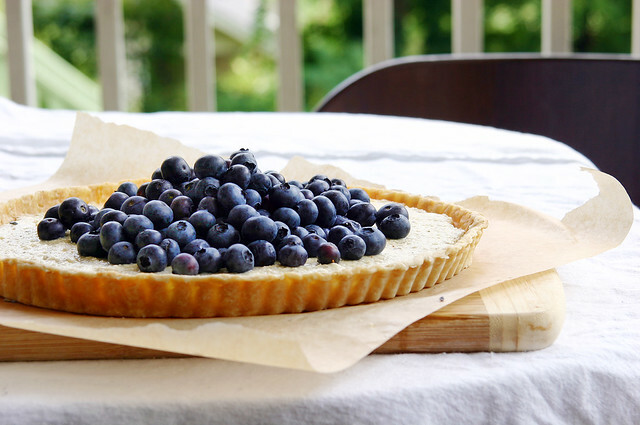 A little bore with blueberry juice, this tart is a great staple. Yummy! I had a Dr. write fish oil down on his Rx pad once, but never blueberries! They definitely have tons of antioxidants to help smack down those would be cancer causing free radicals. I usually have them in a smoothie every morning. I love the regenerative, healing properties of different foods. It’s such an amazing symbiotic relationship we have with the planet! Look at how blue those are! We have a recipe where we mash or puree the berries right into the custard…that turns out purple, of course. And I’ve never really tried lavender with blueberries – that’s an idea worth having up my sleeve. 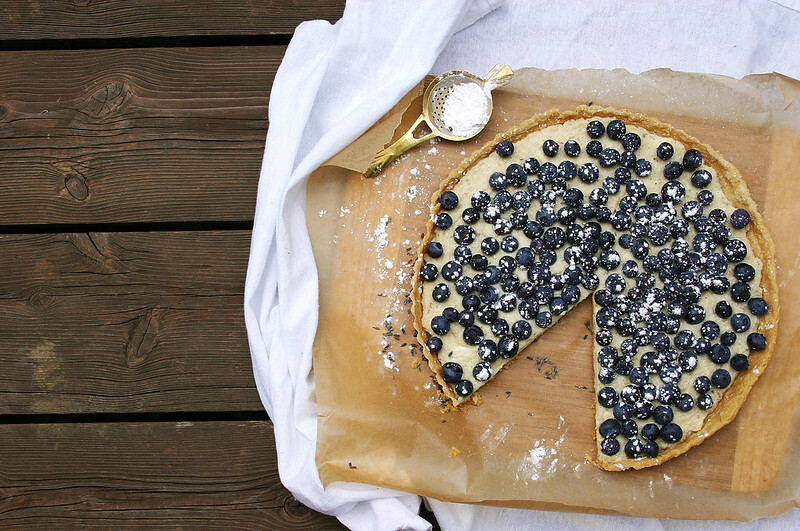 Your pie looks stunning and perfect for summer. Thank you! And I have a child like affinity for purple foods… purple pancakes are a specialty of mine! This looks incredible. I could just stare at that beautiful blue…I love the idea to use lavender with it! I’m a raspberry fan myself but I do make blueberry muffins just about every week. Great post! I put lavender in all the things! YUMMY!! Thank you for this recipe. I just made it and I am so happy. I used agave instead of honey and did a little shortbread crust, but I love the homemade ricotta. I bet it would be wonderful w/ agave and shortbread! I wouldn’t mind trying it with agave myself. I’m so glad the recipe worked out for you… I always love hearing about people making my recipes! I made this last night and… YUM! So good! And the crust is one that will appear in my house regularly from now on. I loved reading the narration about your husband, too. Very entertaining. It makes me very happy to hear about it when people make my recipes and like them! That crust is my stand by. Works so well for everything from chocolate pie to quiche. And while he’s not my husband, he is very entertaining indeed. We’ll call him my eccentric (albeit brilliant!) life partner. Where can I find dried ground lavender that’s safe to eat? I also wanna make rose flavored gelato but I don’t know where to look for roses that aren’t doused in chemicals. You can by culinary lavender online like here: http://www.etsy.com/listing/61409243/culinary-lavender-edible-14-pound and sometimes at natural food stores. For rose flavor you can also try rosewater which is what I usually use. A little of it goes a long way! Beth—I’ve been reading through your archives in spurts at the office, my quick little break between tasks, and, just wow. Your writing, your stories, your ideas (and ideals! ), and how you weave it all together, layered with stunning photography is just amazing. I’m so enjoying myself! Thanks for sharing this bounty of loveliness. Thank you so much! It really makes me happy when I hear that people are reading & not just skimming images..as is generally the nature of the internet! So thank you, and I’m so happy you like it. My mom is allergic to Goats Cheese but I LOVE this recipe! What can I do? Beautiful blog, charming stories of love and a delicious recipe to boot! I heart you. Thank you for this lovely post. I’m having trouble with the consistency of the filling, it seems to be running way too thin. Is there anything I should do to remedy this before spreading it into the crust? Could you substitute Lavender oil for the dried lavender? This look amazing and I don’t wan to wait for culinary lavender to get here. Hi, I wanted to try out this recipe using the homemade ricotta, which I’ve made before for your amazing ravioli recipe. The link to the homemade ricotta is no longer working & I can’t recall the recipe from memory. Can you fix the link or send it to me via email? Thanks!